Instant-Classic Before It Has Even Arrived!!! 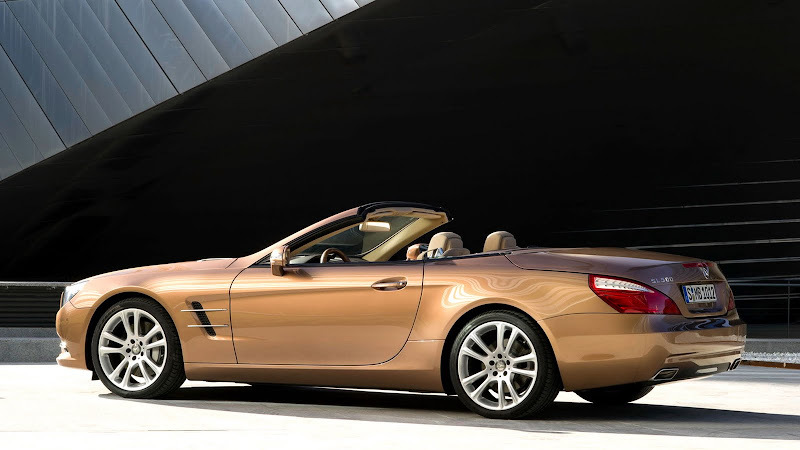 I decided to write this review of the 2013 Mercedes-Benz SL Roadster because the History of the Mercedes-Benz SL is fascinating and it is one of the most iconic automobiles ever made. Mercedes-Benz just celebrated the 60th anniversary of the flagship SL Roadster bodel by launching the 6th generation version with the advent of the all-new 2013 SL-Class Mercedes. The SL is an extremely comfortable sports-car that has always been extremely elegant and timeless–ever since its introduction in 1952. The "S" in SL stands for "Sporty" and the "L" stands for "Light." One of the interesting details you first notice on the all-new Mercedes-Benz SL is the distinctly unique face with eagle-eyed headlights. The headlight detail is truly fascinating, because on one hand they look like an eagle or falcon eyes, and at the same time they kind of look like an exotic woman's eye with King-Tut Art-Deco mascara makeup (Think Sofia Loren in the Late 1950s). In other words, the headlighst are really masculine and really feminine at the same time. They kind of remind me of the Philadelphia Eagles logo. As I mentioned the Merceds-Benz SL Roadster is one of the most iconic and instantly-recognizable cars ever made–kind of like the Rolex Submariner. If you own a Rolex Submariner and you examine the round marker on the hour-hand, you will notice it is remarkably similar to the round Tri-star Mercedes-Benz trademark logo–which also happens to be the universal peace sign. The new model is 2 inches longer and 2 inches wider than the outgoing model, yet it weighs several hundred pounds lighter. This weight loss is attributed to the fact the all-new SL is almost 90% aluminum, which results in a significantly lighter, and stiffer chassis. 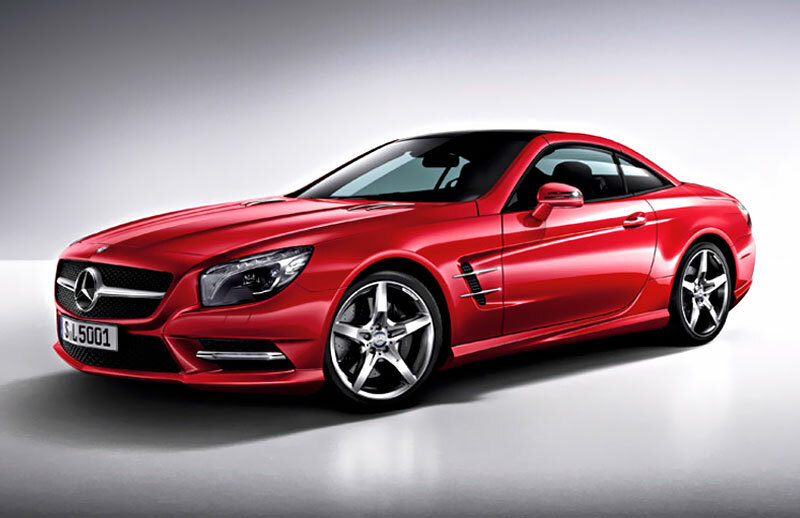 The all-new 2013 Mercedes-Benz SL is sugar-coated with amazingly useful technological innovation. 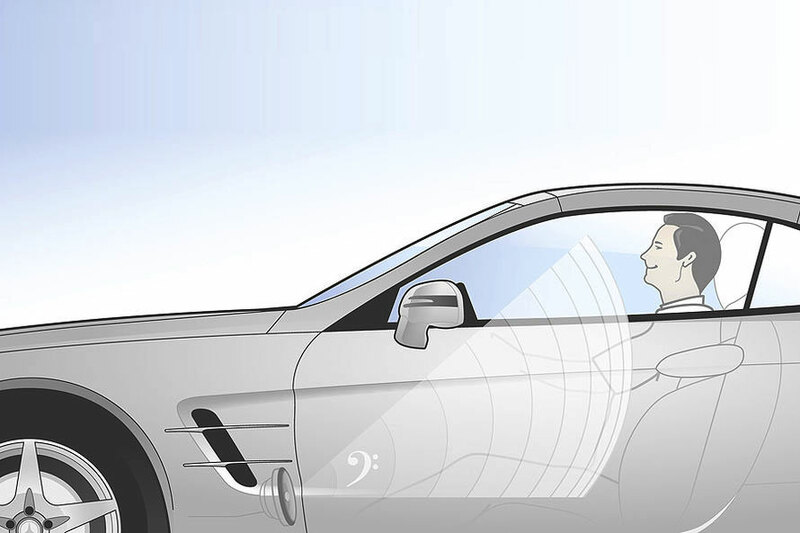 For instance, the all-new Hands-Free Access System allows the owner of the car to open and close the trunk by simply standing in front of the rear trunk, and waiving/gesturing/swiping their foot under the rear of the trunk area. This means if you approach the SL with bags of groceries, you can pop the rear trunk lid without having to grab your keys–just amazing!!! One of the great features of the outgoing and incoming versions of the Mercedes-Benz SL is that it has a built-in reclining hard-top convertible which almost instantly transforms the SL from a hardtop coupe to a convertible roadster. In other words–as you can see in the videos below–you press a button, and the hard-top roof retracts itself and automagically stores itself in the trunk. The Mercedes-Benz SL has arguably always been the King Of Convertibles, and if that fact was ever in dispute, the new SL is unequivocally the King, not just in form, but in function and largesse. The Mercedes-Benz SL Roadster has always been the International Mark Of Success, as is wearing a high-end Rolex. It is just amazing how stylish and elegant the new SL model is!!! The more you study all the industrial design details, you notice that Mercedes designer left no stone unturned when it came to detail. This next images below is a good side profile shot that shows a special edition which is available with a really sporty red-and black interior. The new SL is busting out with everlasting style!!! I should mention, many other automobile manufacturers have tried to copy the Mercedes SL with no success. Lexus tried with their SC430 and failed, as did Ford with their updated T-Bird and Cadillac also tried and failed. Even BMW tried with their Z9 convertible, but they also failed and gave up. Despite all the copycats, Mercedes-Benz has continuously succeeded with the timeless SL Roadster. The all-new Mercedes-Benz SL features an amazing cockpit that has extremely low wind-noise, even at high speeds. Don't ask me how Mercedes pioneered this design feature, but I know from having driven the previous generation SL that when you are driving around–even on the highway–the cockpit remains silent. It basically sounds like you have the sunroof open. How Batmobile looking is that steering wheel!?! The Mercedes-Benz SL also has a feature named "Air-Scarf" which places a heater vent just below the rear of your neck, so if you drive around with the top down, the Air-Scarf will keep you pleasantly warm–even when it is really cold outside. If you examine the image below, you see the Air-Scarf vent located at the bottom of the headrest. 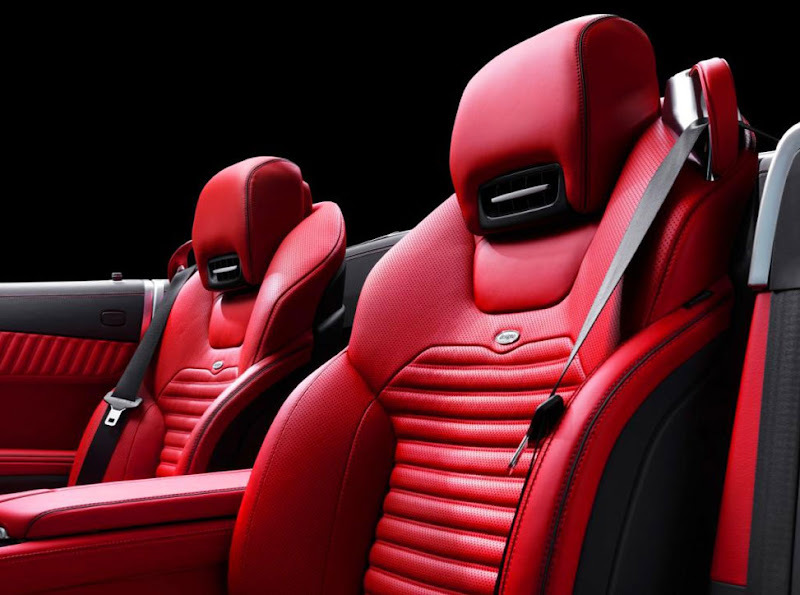 The all-new Mercedes-Benz SL also offers heated and air-conditioned seats. Air conditioned seats keep you cool and dry on long trips, so when you arrive at your destination the back of your shirt is completely dry because you skin can breath. I believe the new SL also has built in massagers in the seats, for the ultimate in true luxury. I believe the all new Mercedes-Benz is the ultimate convertible made on earth today. While other manufactures like Ferrari and Porsche make really cool convertibles, there is simply no other convertible that comes close to the SL. Why? First of all, the all-new Mercedes SL is the second generation of Mercedes that offers a hard-top convertible, meaning–at the touch of a button–the hardtop automagically descends into the trunk. This feature give you the best of both worlds, so that when you have the top up, you have a much quitter cabin that feels and drives like a non-convertible coupe. Also, the hardtop convertible can't wear out easily or show age like a canvas roof. It is also sturdier and more secure, not to mention, you can't get holes in the top from wear or a thief trying to cut through the top to gain access to the cabin. 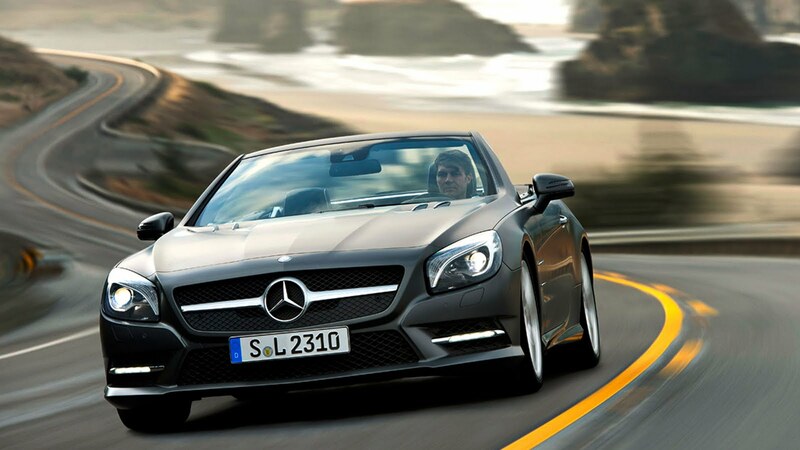 The all-new Mercedes-Benz SL Roadster is a technological marvel and powerhouse of leading future technology. It is sugar-coated with unique features that are highly useful and powerful. In the three images we seethe Magic Sky Control Sunroof. This first image shows what the 2013 SL looks like from the top. The SL will come in two different versions. One with the Magic Sky Sunroof which at the touch of a button instantly transforms the glass moonroof from opaque to transparent. The way it works is the roof of the convertible hard-top has a transparent moon-roof so if you are driving with the top up, you still get the feeling of being in a convertible with the top down. 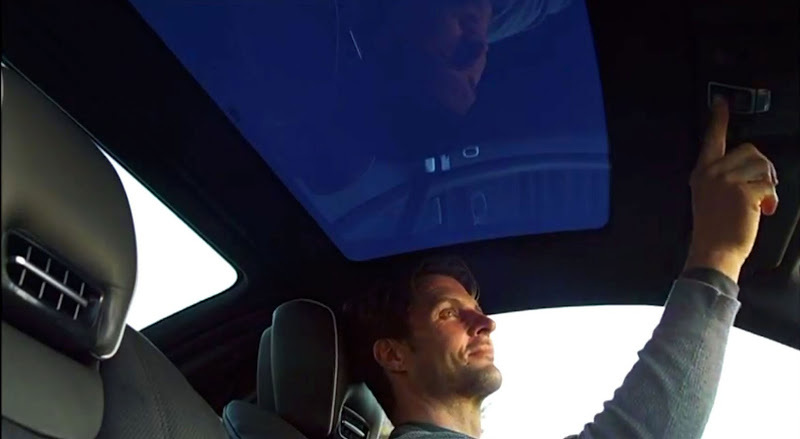 In this next image we see the driver with the Magic Sky Sunroof opaque, or in the dark state. 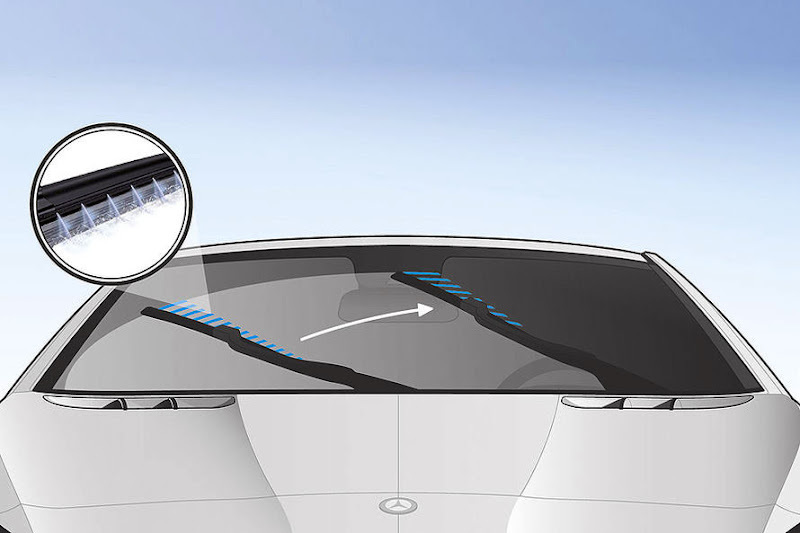 The driver pushes a button and instantly the Magic Sky Sunroof becomes transparent as seen in the second image. This stops the interior from feeling claustrophobic by flooding the cockpit with plenty of ambient daylight. Also, if you are cruising on a cold winter day, you can remain toasty in the cabin, while enjoying the feeling of being in a convertible–with the top up!!! 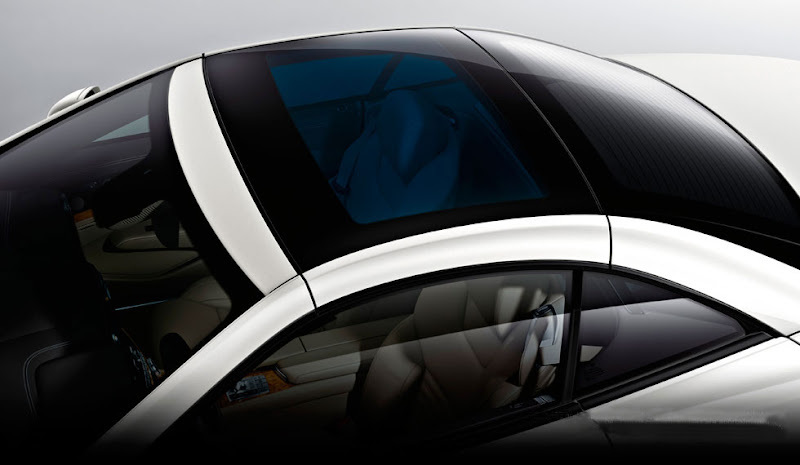 The second moonroof option is shown below, where you have a sliding valance panel that slides out to cover the transparent glass moonroof. Mercedes-Benz invented this technology, and they are the only company that offers these extremely innovative moonroof features. 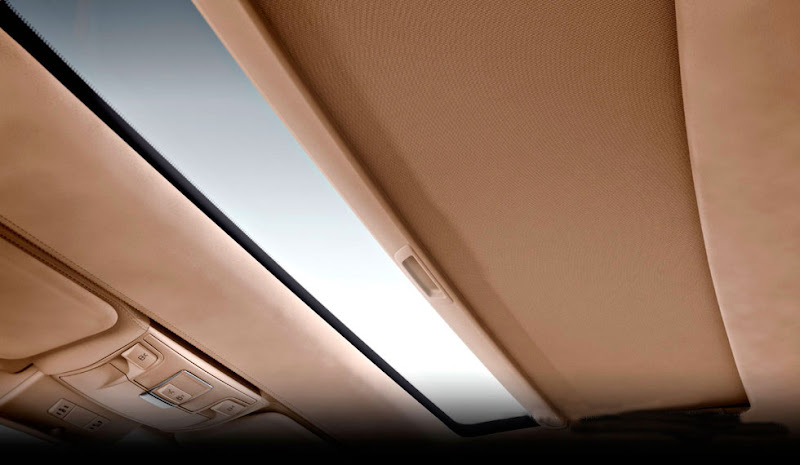 Being able to close the valance panel or make the transparent glass moonroof opaque also helps keep the cabin cool in summer time, if the car is parked in a sunny place. 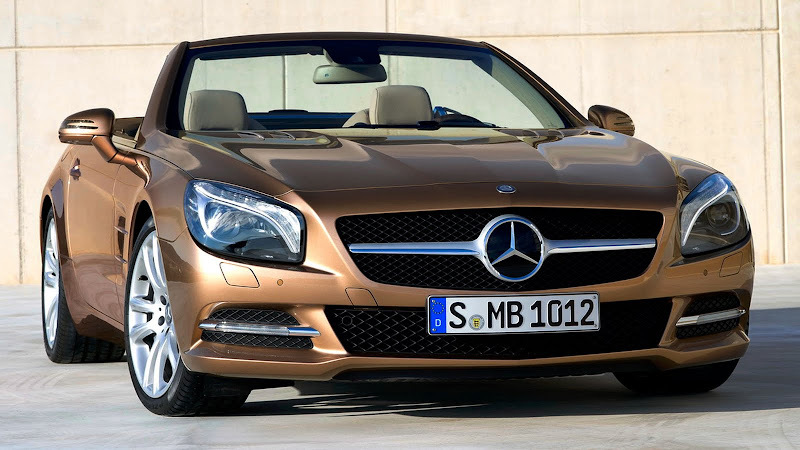 The all-new Mercedes-Benz SL has a super-innovative windshield wiper system named Magic Vision Control, which, instead of shooting water from the front hood deck, shoots warm water out of mini-jets built into the windshield-wipers as seen in the next two photos. 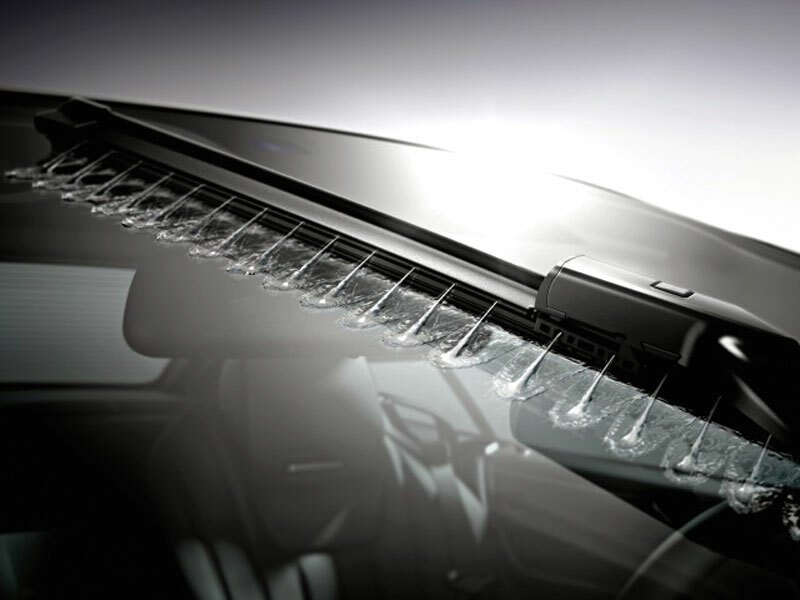 This stops excess water from overshooting and missing the windshield and it also stops the driver from being temporarily blind as traditional jets shoot out windshield washer solution. The Magic Vision Control System is programed to behave differently under different situations. For instance in winter summer or depending on whether the cabriolet top is up or down, it will behave differently. The system automagically varies the amount of water output depending upon speed, ambient temperature, and current driving conditions which include ambient temperature. The all new Mercedes-Benz SL Roadster is significantly lighter and stiffer than its outgoing predecessor which it is replacing. This dramatic lightening results in more agile handling couple with better road feel for the driver. 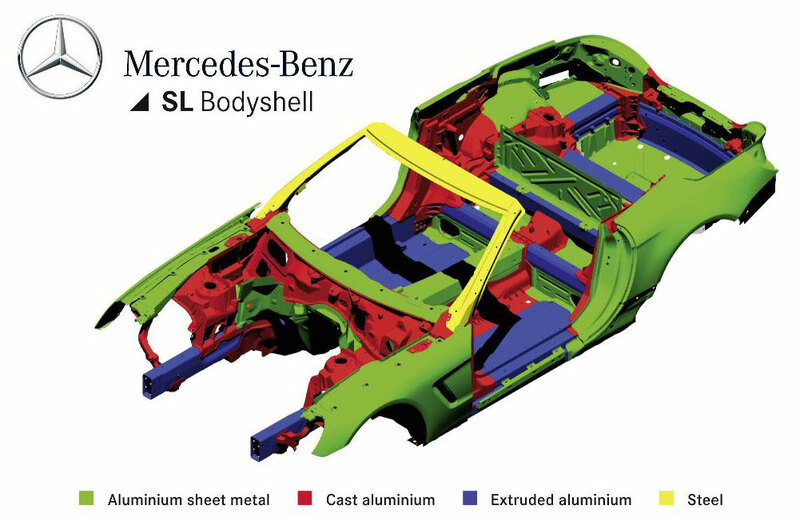 Approximately 89% of the new SL is made from aluminum which is either cast, extruded or sheet metal as illustrated in the image below. 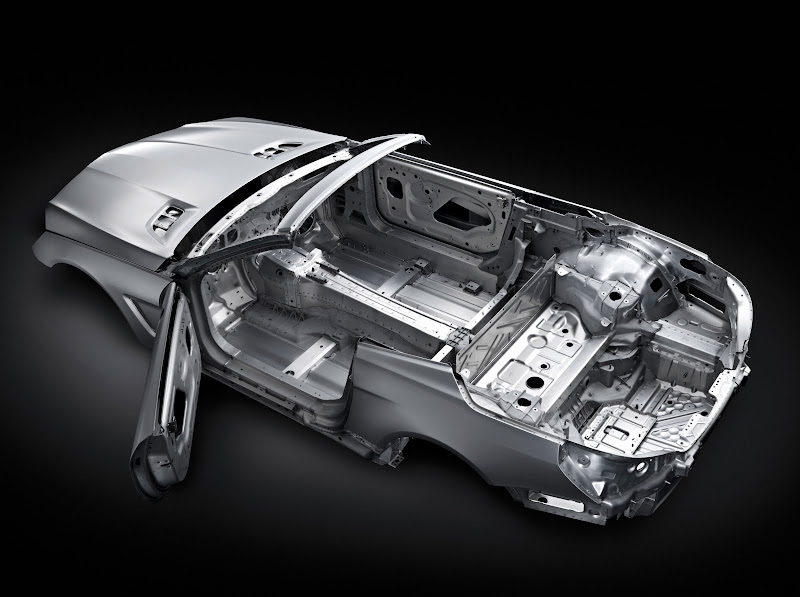 This next photo shows the primarily aluminum structure which is just amazing. It is literally a work of art, in-and-of-itself. The all-new Mercedes-Benz SL will introduce the highly innovative all-new "FrontBass" music delivery system, which delivers amazing sound, even when the top of the SL is reclined. 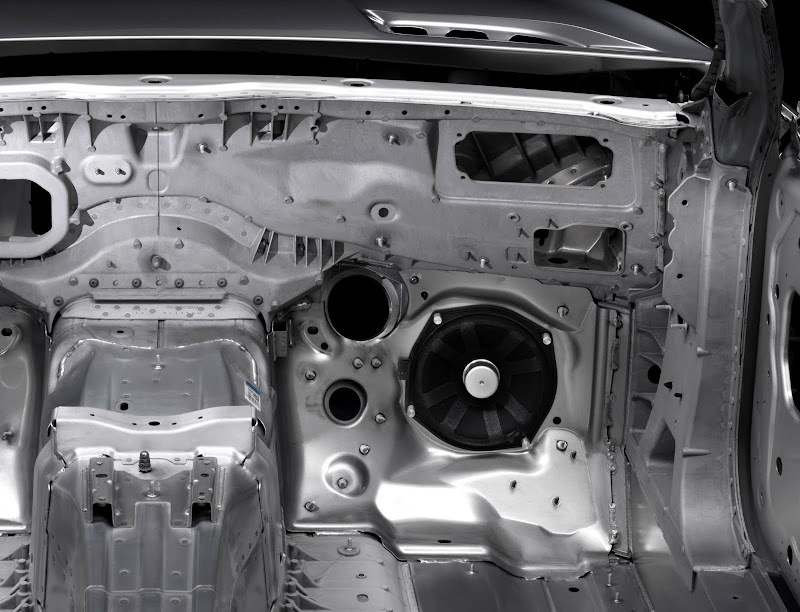 The FrontBass system strategically places the speakers in the firewall openings instead of in the traditional doors. This essentially makes the cabin a behave like a huge speaker. Mercedes-Benz says of the FrontBase system: "The unique FrontBase system, turns the SL luxury sports car into a concert hall–with the top down or up." Notice in the photo above, the two speaker holes located in the front footwell firewall. In the photo below you see the right FrontBass speaker placed strategically in the firewall. This permits the deep bass sounds to better resonate throughout the cabin by creating a resonating chamber for the woofers. In other words, it is turning the car structure into a big woofer. The all-new Mercedes-Benz SL Roadster will be offered in some limited editions, including the version seen below with a matte black paint finish. The standard 500SL is also fast and does 0-60mph in just 4.5 seconds. 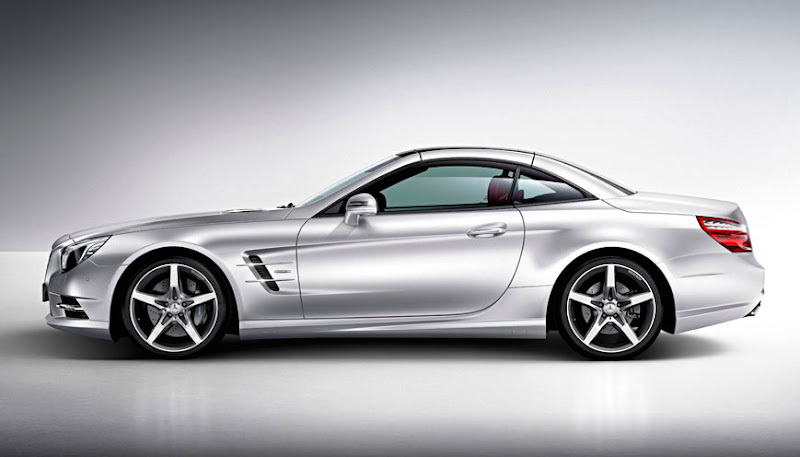 The all-new Mercedes-Benz SL Roadster will be making its official debut next month at the 2012 Detroit Motor Show. As I mentioned earlier, I believe the Mercedes-Benz SL Roadster is very similar to the Rolex Submariner in the way it has evolved. 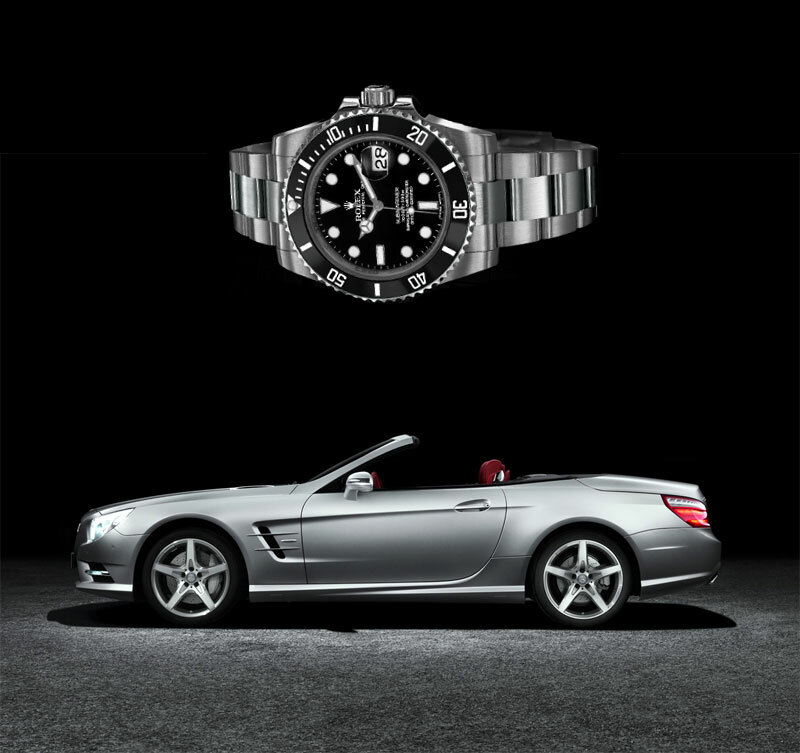 In other words, if the Rolex Submariner was car, it would be a Mercedes-Benz SL Roadster. Why? Mercedes-Benz introduced the Mercedes-Benz SL Roadster in 1954 at the New York Auto Show, and Rolex introduced the Rolex Submariner in 1954 at the Basel Fair Show in Basel, Switzerland. Also, both the Rolex Submariner and the Mercedes-Benz SL Roadster have much more in common, including their distinctive signature silhouettes, which are always instantly recognizable from any distance. The Submariner has always had a heft-tuetonic Germanic industrial design, as has the Mercedes SL Roadster. 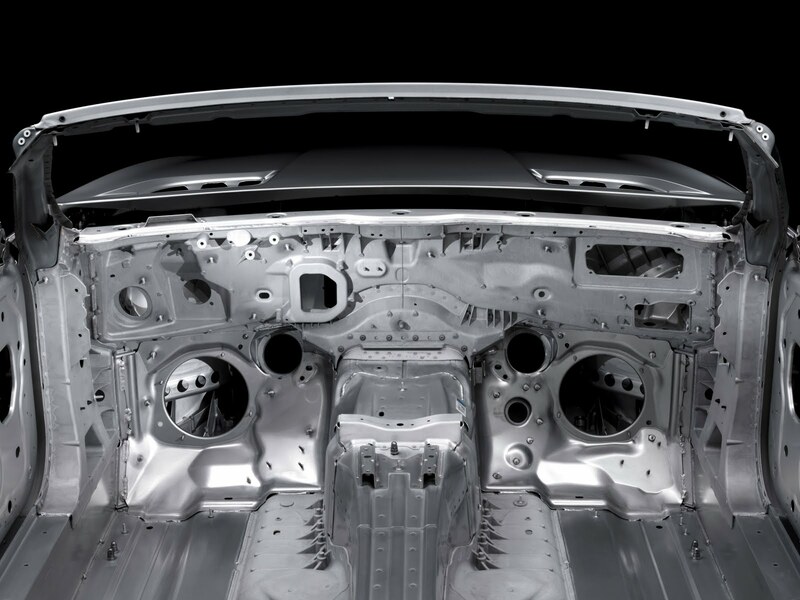 Look at the next photo below to see how similar the design language is between the all-new 2012 Submariner and the all-new Mercedes-Benz SL Roadster. Another thing Rolex and Mercedes have in general is that they both became major status symbols in the early 1980s. In 1980, Ronald Reagan was elected President of the United States and timeless elegance was back in style. The seminal 1980 movie American Gigilo played a large role in popularizing the Mercedes-Benz 450SL Roadster because Richard Gere, drove one in the movie and the opening sequences of the movie played the iconic Blondie song Call Me, as Richard Gere drove around in his 450SL as seen in the video below. 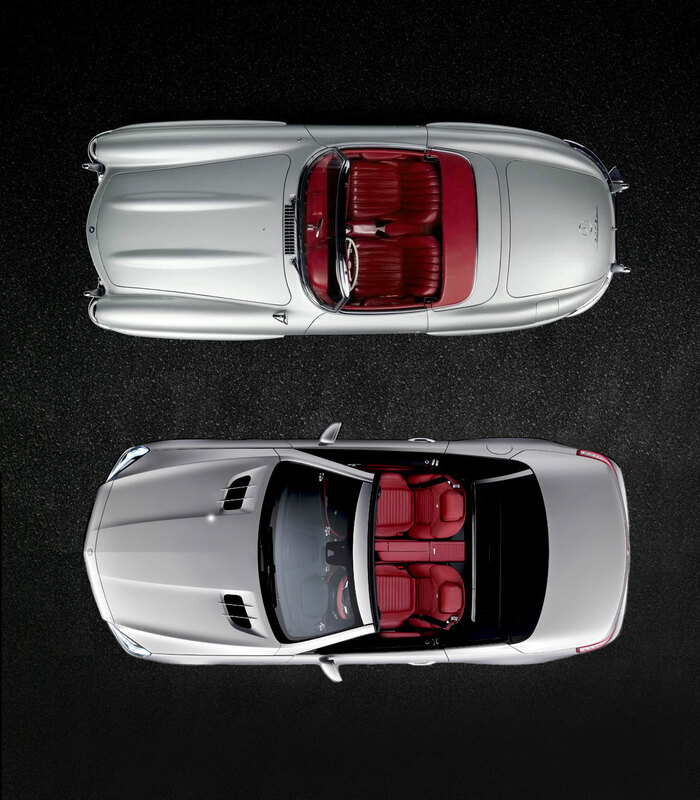 Pictured below is an image which illustrates the evolution of the Mercedes-Benz SL Roadster from its introduction in 1952, all the way up through the all-new 2013 SL Roadster. There really is something to be said for evolutionary design!!! Mercedes introduced the 300SL Roadster in 1957 to replace the Gullwing. The design inspiration for the all new Mercedes-Benz SL Roadster was obviously the 1957-1963 Mercedes-Benz SL Roadster (W198), and in the next image you can see them side-by-side. 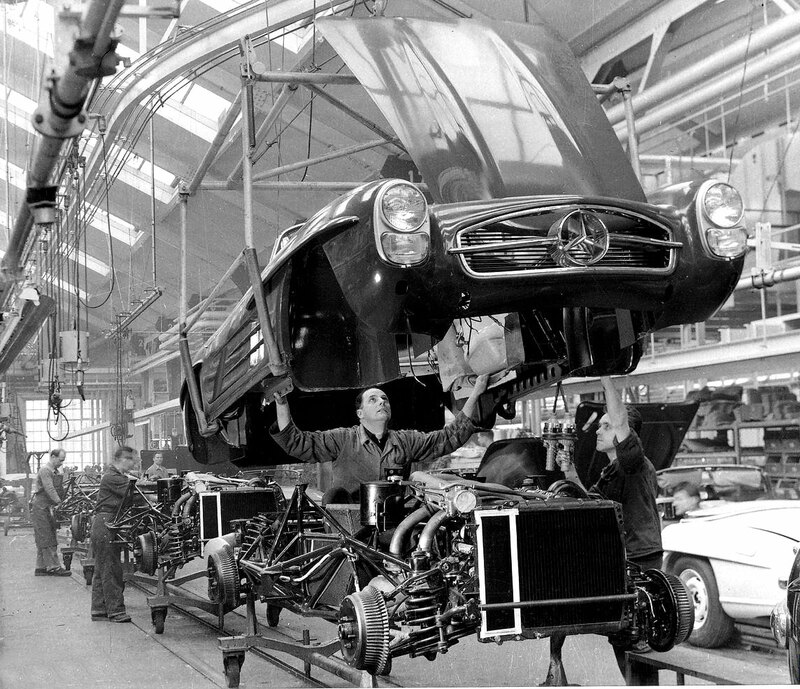 This next image which was taken in Germany on February 20, 1958 shows the production line for the Mercedes-Benz 300SL, which is absolutely fascinating. Here is a new Mercedes-Benz Magazine ad photo that features the all-new SL Roaster with the matte black paint job and it features top model Lara Stone. This ad should start running in international magazines soon. This next photo shows a driver in the very sporty cockpit of the upcoming new 2013 Mercedes SL Roadster. It is amazing how outstanding and perfect the design is on the inside and outside of this instant classic!!! The matte black Mercedes-Benz SL Roadster pictured in the two pictures above is classic for many reasons, and seeing it reminded me of this Dior Homme video, named Un Rendez Vous which starts Jude Law and was directed by Guy Ritchie. Guy Ritchie was married to Madonna. Notice Jude Law driving around the streets of Paris in a late 1950s Mercedes SL Roadster.